Our range of Gesipa tools includes hand rivet tools, lever riveting tools, battery powered riveting tools, pneumatic-hydraulic riveting power tools and blind rivet tools. Listed below are our categories for Gesipa rivet tools we have on offer at the moment. Please select the section that best meets your rivet tool needs. We have a massive selection of Pneumatic-Hydraulic Riveting Tools for a range of purposes, providing a wide variety of working capacities for almost any need. 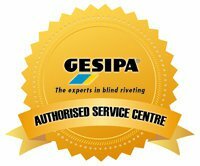 Gesipa’s fully automatic Blind Riveting Unit for industrial applications is capable of setting 45 Rivets per minute increasing the productivity, saving time and cost by approximately 50% compared to conventional blind riveting tools.